It was precisely the above situation that led me to Freedom Foods in the land down under a couple weeks ago. When Luke and I went in to meet his preschool teacher prior to the start of school, we went over all the usual suspects: daily snack time, gluten-free art supplies, gluten-free oats for the tactile stimulation table, his gluten-free treat box, etc. All was going wonderfully well until Ms. S dropped the bomb. The class would be making Fruit Loop necklaces the following Monday (as in 7 days later). Anyhoo…I came home from the meeting with Luke’s teacher and started thinking of a good alternative since Fruit Loops are loaded with glutonium and other gnarly ingredients. I thought we could go to the craft store and pick out some colored beads. Or, we could make colored gluten-free dry pasta. 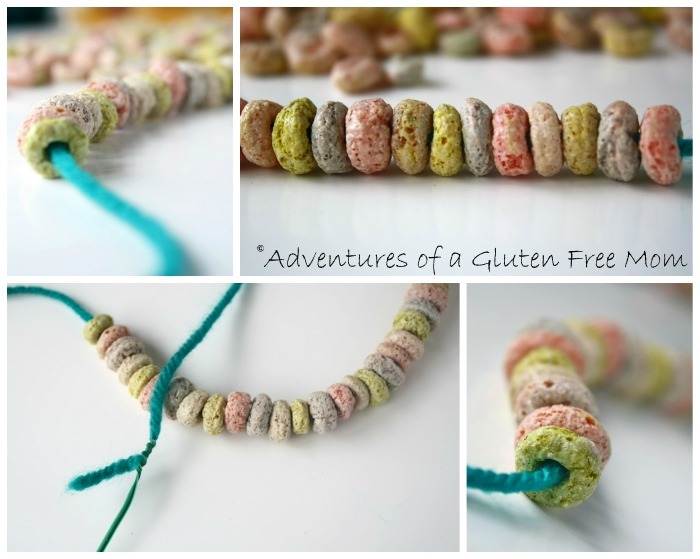 I even went so far as to make some blue GF macaroni but the vision of my precocious 4 year old breaking a tooth when he bit down on an inedible substitute compelled me to query the almighty Google on “gluten-free fruit loop necklaces” to see what other moms in my situation have done. I didn’t find an answer, but I did see that I was not the only mom asking this all important question! 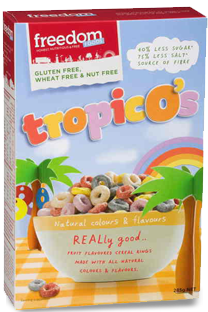 I redefined my search to “gluten-free fruit loops” and that’s when it happened <insert voices of heavenly choir basking in gluten-free glory here>, Freedom Foods’ Tropic O’s cereal popped up on the website of Absolutely Gluten Free as the top listing in my Google search. I was so beside myself with excitement that I didn’t even notice it was an Australian website. I emailed the kind folks at Absolutely Gluten Free to see if they would ship overseas but in order to get it here on time, I would need a second mortgage to pay for the shipping (my husband is very supportive when it comes to my “bright ideas” but this one may be grounds for divorce, LOL!). To make a long story short(er), I ultimately discovered a company in California, Wholesome International, that recently began importing some of the Freedom Foods gluten-free cereals. So recent in fact, they were still working on the list of places where consumers can buy the products, including Amazon (you should definitely submit your email address to Amazon so you can be notified the next time Tropic O’s are in stock….I do believe my Facebook fans and Twitter followers wiped out the entire supply within a few hours of debuting last week, LOL!). A few phone calls later, and I found Sarah, a representative of Howell Mountain Distributors, who patiently listened as I explained my desperate situation and she agreed to sell me a case of the newly arrived Freedom Foods Tropic O’s with expedited shipping. When the cereal finally arrived 2 days later, I was like a kid at Christmas (and I rarely buy gluten-free processed foods anymore). This however, was an occasion to celebrate. While I have been working very hard to change my family’s diet over to real, whole foods; nurturing my children’s emotional well-being is just as important to me as keeping them healthy. And like it or not, it is very important for children to feel “normal” around their peers, they’re pack animals at this age. I know all too well (and so do my parents) the potential consequences that can happen when an adolescent has an unmet need to feel like they belong. Besides, compared to Kellogg’s Fruit Loops, the Freedom Foods Tropic O’s seem almost healthy by comparison (they do still contain sugar afterall). I’ll get to the good stuff in a minute, but if you would, please indulge me for a second (or two). As you can see above, the ingredients in Freedom Foods Tropic O’s are: Flour Mix (Rice Flour, Wholegrain Sorghum Flour & Non-GMO Maize [corn] Flour), Cane Sugar, Psyllium, Natural Colours (Turmeric, Fermented Rice Powder, Gardenia Flower Extract, Sweet Potato Extract), Palm Oil (as emulsifier), Natural Minerals (Tricalcium Phosphate, Iron), Salt, Natural Fruit Flavors, Vitamins (Niacin, Thiamin, Riboflavin, Folic acid). Now lets compare those ingredients to Kellogg’s Fruit Loops: Sugar, whole grain corn flour, wheat flour, whole grain oat flour, oat fiber, soluble corn fiber, contains 2% or less of partially hydrogenated vegetable oil (coconut, soybean and/or cottonseed), salt, red 40, natural flavor, blue 2, turmeric color, yellow 6, annatto color, blue 1, BHT for freshness. First thing to take note of is the sugar. 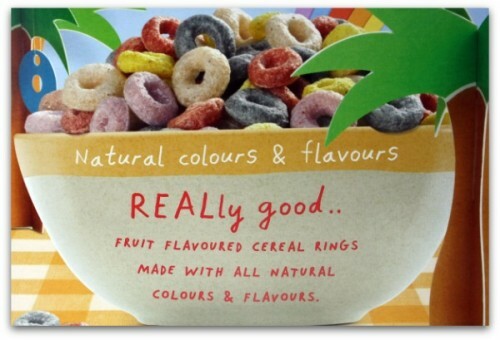 Tropic O’s lists cane sugar as the second ingredient whereas Fruit Loops lists sugar in the number one spot. Translation: there is more sugar in Fruit Loops, in fact, there are 4 additional grams of sugar for each one cup serving compared to Tropic O’s. So what does that mean exactly? I did an eye opening experiment a year and a half ago on Kellogg’s Yogos (click here) and I encourage you to check it out. Now let’s take a closer look at artificial food dyes, shall we? The following information is from the Center for Science in the Public Interest, in the article, Food Dyes: A Rainbow of Risks. Almost all the toxicological studies on dyes were commissioned, conducted, and analyzed by the chemical industry and academic consultants. Ideally, dyes (and other regulated chemicals) would be tested by independent researchers. Furthermore, virtually all the studies tested individual dyes, whereas many foods and diets contain mixtures of dyes (and other ingredients) that might lead to additive or synergistic effects. For more information, see Diet and Nutrition: The Artificial Food Dye Blues (Environ Health Perspect. 2010 October; 118(10): A428, PMCID: PMC2957945). Robyn O’Brien also wrote a very insightful article on her website, Allergy Kids: Serving Up Food Dyes, UK Style and I encourage you to read it. Now that the once-ubiquitous but invisible trans fats are listed in bold print on food labels, it’s easier to spot them in packaged foods. Keep in mind, though, that according to the FDA, a product claiming to have zero trans fat can actually contain up to a half gram. (Canada set a different standard of zero as under 0.2 grams). So you may still want to scan the ingredient list for “partially hydrogenated vegetable oil” and “vegetable shortening,” and look for an alternative product without those words, especially if it’s something you eat regularly. 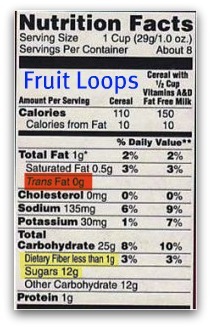 So, even though Kellogg’s states that there are zero trans fats in Fruit Loops, that isn’t exactly true. Kinda like how the label “gluten-free” does not mean the same thing as “free of gluten!” (click here to learn more). I don’t mean to pick on Fruit Loops, because this is just one of thousands of products that contain similar ingredients (just check out my friend Melissa’s post on the newly labeled gluten-free Fruity Pebbles). Artificial food dyes are in everything, heck, they’re even in Vlasic Pickles and foods you would never think contained artificial colorings because they’re not neon colored, like Kraft’s regular white marshmallows which contain blue dye (think little blue haired old ladies. apparently bluing agents correct any yellowing that occurs in the color white) and General Mills‘ brown Cinnamon Chex cereal which contains yellow 6 lake and blue 2 lake (aren’t yellow and blue supposed to make green?). Maybe a little artificial coloring is truly harmless, but if you’re eating it for breakfast, lunch, dinner and snacks, 7 days a week, 4 weeks a month and 12 months a year…well you get my point! I won’t enter into the debate on artificial food colorings and hyperactivity in kids, because there are other issues I think about. One has to wonder if all the synthetic colorings, preservatives, genetically modified ingredients, pesticides, etc., that are so prevalent in the American food supply, have played a part in the ever increasing prevalence of celiac disease, food allergies, autism, ADHD, autoimmune disease (and the list goes on and on). 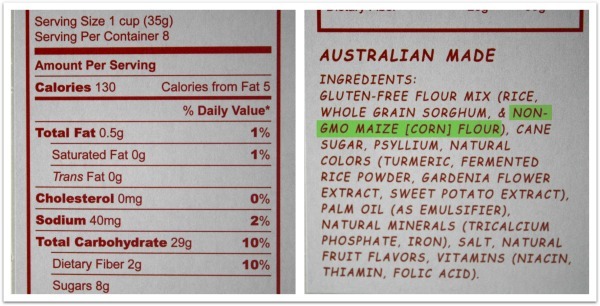 Did you know that 70% of the US corn crop is genetically modified? As is 93% of the US soy crop (see Robyn O’Brien’s article, Didn’t Realize Our Food Contains GMO’s? You’re Not Alone and if you want to learn more, I highly recommend picking up a copy of Robyn’s book, The Unhealthy Truth: One Mother’s Shocking Investigation into the Dangers of America’s Food Supply– and What Every Family Can Do to Protect Itself . EVERYONE should read this book, it is nothing short of astounding). While GMOs are a highly controversial subject matter, the fact remains, there is NOT enough research to support the safety of genetically engineered foods. Not only is there the possibility of transferring allergenic proteins from one food to another, but scientists are creating brand new proteins that have NEVER before been in the human diet. How do you think our immune systems are going to respond to that, especially in those who have increased intestinal permeability (a.k.a. leaky gut)? Even if my children could have gluten, knowing what I know now, I would still buy the Freedom Foods Tropic O’s over Kellogg’s Fruit Loops. The only way U.S. manufacturers are going to change is if informed consumers demand it and put their money where their mouth is (the gluten-free market is the perfect example of this). And as Robyn O’Brien pointed out in her above mentioned article Serving Up Food Dyes, UK Style, major companies like Coca Cola and Kraft are already doing this in other countries where the public is much more aware. I just started finding out the truth about “what’s really in our food,” maybe 2 years ago when my family’s health began spiraling out of control. And the more I think about it, the angrier I get, so lets move on to a happier subject, the taste of Freedom Foods Tropic O’s cereal! I couldn’t taste the cereal personally because I’m allergic to corn but my husband said they taste just like what he remembers Fruit Loops tasting like. My kids absolutely loved them (so much so, I had to hide 4 of the boxes because I still view this as a treat, not an everyday breakfast staple). In addition to the Tropic O’s being gluten-free and synthetic dye-free, they are also: dairy-free, egg-free, soy-free, nut-free and sesame-free. In 2009, Freedom Foods established a dedicated ‘free from’ factory in Stanbridge in the New South Wales Riverina (near Leeton.). Our factory is one of the few factories around the world that is free from wheat, barley, triticale, sesame seeds and nuts. Not only do we produce our Freedom Foods Cereals and Biscuits at Stanbridge, but we also actually mill many of the raw ingredients that we use at the factory. We test every batch of products produced at Stanbridge to ensure that gluten, peanut, almonds and hazelnuts are not detected. Our Stanbridge site is completely free from wheat, rye, barley & triticale and we ensure that the oats that we bring on site are not contaminated with wheat. Every batch of our product is tested to ensure that no gluten is detected. Tip: to make a safe “needle” for kids to assemble their necklaces, wrap a twisty tie around the end of a piece of yarn. Know what else these will be great for? Decorating Gluten-Free, Allergy-Friendly Gingerbread Houses (which reminds me, I better get to planning my 2012 unmasterpiece, LOL!). Would you like to try Freedom Food’s Tropic O’s for yourself? Well, here’s your chance! The folks at Wholesome International have kindly offered to give three of my readers a FREE mixed case of cereal from Freedom Foods! To enter for a chance to win this giveaway, simply leave a comment! *This giveaway is open to U.S. residents only. Share the link to this giveaway on your Facebook Page (be sure to tag @Adventures of a Gluten Free Mom in your status update so I know you did this). Tweet about this giveaway (be sure to include a link to this page and include @adventuresgfmom in your tweet so I know you did this). Share the link to this giveaway in a blog post. I'm wishing we had these TODAY when they did the Froot Loop necklace! I'm also glad that his wheat allergy was not so bad that he couldn't string the loops on, but it broke my heart that he couldn't eat them!!! It is so great to find a site where I can get food that my almost 3 year old grandson can eat. His allergies are to so many foods and we haven't discovered all of them yet. He will love this cereal. I shared it on Allergic to Air's Facebook page. I follow Freedom Foods on Twitter. I would LOVE the opportunity to try this cereal for my GFCF kiddo. We are finding more and more that as we move away from the over processed, dye riddled foods that he is doing better and better! I follow Wholesome International on Twitter. I am posting a link to this on facebook!! This cereal looks great. Thanks for bringing these to my attention. Can not wait to give these to my kids!! They will be sooo excited. I would LOVE to win some of these to try! I "liked" freedom foods on facebook. How exciting for our kids to have a chance at some "traditional" foods. I also liked Freedom Foods on facebook and am looking forward to trying more of their products. We are SO on the same wavelength today! Oh, my gosh, this is eery. I've read Robyn's book as well. She includes some scary and eye-opening information about our food system. This is great information you've compiled here. We can always count on you to bring all the threads together in one thoughtful post. And thank you for linking to my cereal post. I appreciate it. It's frustrating how dishonest the food industry is when marketing this stuff to kids. and want to Share the link to this giveaway on your Facebook Page But I don't know how to "tag" you. I am doing this right now…I hope I do it right…Tweet about this giveaway (be sure to include a link to this page and include @adventuresgfmom in your tweet so I know you did this). Also liked on Facebook, followed on Facebook and re-tweeted! Great to find more and more people sharing this journey of gluten free with me. I have three children that have celiac and am always trying to be creative so they are not left out in the growing up experiences. Another item to make life a little easier! I am now a follower of Freedom Foods on twitter as well. Thanks again! I really hope I win. I am struggling with feeding my 6 yo who I recently found out is sensitive to gluten and dairy. Your blog is full of so much information and I truly appreciate all of your hard work and willingness to share your lesson's learned. I would also like to add a link to Robyn O'Brien's TED talk: http://www.youtube.com/watch?v=rixyrCNVVGA . Wow, we'd love this! Our 2 preschool boys are GF. I "like" freedom foods on facebook as well. Posted a link on Facebook to the giveaway. Sounds like great products. Would love to try them. Oh my goodness! Gf fruit loops! That taste good? Gluten free gods be praised! I just got way too excited! I am GF and the kiddo is nut free so we make a bad combo for shopping. By the looks of the ingredients it looks like we might be able to enjoy the same treat! YAY! Thanks for doing this post!! I am a Freedom Foods Fan on FB! I feel like it's Christmas finding some kid food. My son just started preschool so I am constantly looking for things like this. THANK YOU! I liked Freedom Foods on Facebook. I followed Freedom Foods on Twitter. I followed Wholesome International on Twitter. I can't wait to get this cereal for my kiddos. I can't believe I missed it on Amazon. So, you LITERALLY go to the ends of the Earth to find what you want to find. Remind me to give my quest to you if I am ever in need of something difficult to find. Well, I would love to try these puppies out. Leaving' my comment. i have contemplated expedited shipping for GF ice cream cones for a school event so I totally get where you're coming from. Nice work hunting down a solution! And we'd love to try this cereal. I follow Wholesome Int'l. And I think I am done. Thanks, Heidi! These look like a healthier alternative to Fruit Loops. I will definitely become a Freedom Foods on Facebook. That is so cool–to eat fruit loops again! I shared link on my Facebook page! I followed Freedom Foods on Twitter! I followed Wholesome Int on Twitter! Yahoo! I gave up on fun cereals for my boy. He has so many allergies. This cereal doesn't list soy either, so I am totally jazzed! That has been the hardest to avoid. My poor boy has been wanting the froot loops like the other kids in class. Thank you for sharing!!!!! The cereals look wonderful! Thanks for hosting this great giveaway. I can't wait to try the cereals! Hopefully they will become more accessible to us in the US. Thanks for the great education! Heidi – you are an amazing mom! You go through a lot of effort in ensure your children's emotional health. I admire you. What an awesome giveaway and bringing my attention to this product!!!! My brand new kindergartener would be ecstatic over these! Her usual cereal choices include crispy rice and granola. LOL ::off to stalk amazon…I mean, sign up for notifications:: THANKS! I would love to have these cereals when my grandchildren visit! I am sure my 3 celiac kids would rejoice if I put a "fun" kiddie cereal in front of them…Thanks for the opportunity! I liked Freedom Foods on FB. Thank you for the giveaway. My boys would love these…. WOW! So surprised they are dye free as well! As always such great information here. I love your passion around getting real foods into our lives. It's a shame that the FDA's true purpose is to make money for those groups with the most lobbyists. They should be looking out for the consumers like most people think they are. Thank you for finding so much great information and sharing it. I would LOVE to try these-they look delish! Thank you for all the valuable info that you give to me-I love reading your blog! I liked Freedom foods on FB. This is a great giveaway Heidi! I went to Amazon to check it out and they were sold out of the Tropic O's-but I ordered some of the Ultra Rice maple crunch-would love to try the other flavors! YUM! Woo! 5 boxes of cereal? Sign me up, please! I would love to try these! I'm sure my son would happily share them with me as well. I follow Wholesome Int on Twitter @MommaStaciA Thanks! So glad to see a new GF food! I'm sure my granddaughter would love to try it!! This is great…would love to win!!!! I just found your blog today. My one year old needs those fruit loops! Poor baby! Wow! Really want to try them! I love that I found your website. Your articles are wonderful and reassuring I'm doing what's right! I was diagnosed with celiac after being unable to get out of bed for a year. I would never go back to eating the way I ate before. As my kids get older I'm looking for more products to replace the ones they see their friends consuming. It would light up their faces to see a fun and colorful cereal on "cereal Saturday" (the only day they are allowed to eat cereal for breakfast). I'm so excited to get the Tropical O's for my teenage son with Celiac's. We are constantly on the lookout for foods that 'normal' kids eat. As a teen driver with a social life, not being able to eat anything at the teen hot spots is a big dark cloud over my son. Thanks, Freedom Foods for these great options. Wow, what a cool brand Heidi! I'd never heard of them before, but will keep an eye out now. I would love to try that Ultra Rice Maple Crunch – yum! Sounds great! I called Sarah and she asked that we all go into Whole Foods to help them get it into their stores. I guess they have made a presentation but they don't think there is demand. Hello! I'll march in there tonight. Thanks Heidi!!! I'm REALLY impressed that you called Sarah, you go girl! Another thing we can all do is click on the 'Like' button next to their listing on Amazon. I like Freedom Foods on FB. I'm following Freedom Foods on Twitter. I'm following Wholesome International on Twitter. I need these!! My daughter has not had fruit loops in 6 years and would freak!! I would love to try these with my family! Super excited to find a new cereal and company that supports a healthy or healthiereating. Thanks for your wonderful website! I am SO, SO excited!! I was just talking with my 2-yr-old's teacher TODAY about an upcoming Fruit Loop project! 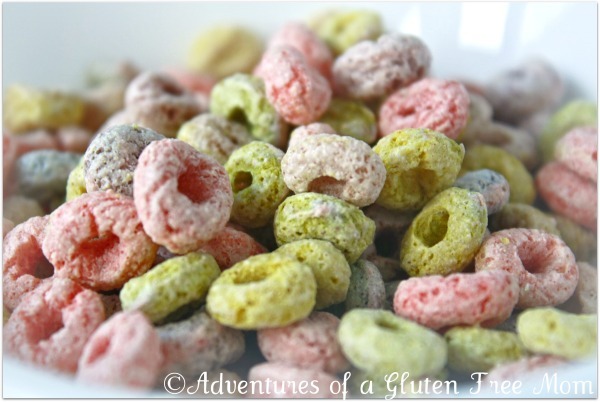 My little girl is gluten-free… I'm so glad that GF "Fruit Loops" exist!! I am so excited for these! We have been food color free for 3 years and they long for colored treats. Love your blog and love trying the new stuff you bring to our attention. I will be looking for this cereal for my boys! My son would love these! He gets tired of the only GFCF Cereal that he eats. Following Wholesome International on Twitter. Crossing my fingers!! I hope we're one of the lucky ones! Thanks for finding these for us!! I hope they will be available for us to buy soon! Liked freedom foods on facebook! What a great find! Fruit loops, what a great treat. Hope to find them soon. Thank you for finding a fun, gluten free, artificial dye free cereal! I can't wait for my boys to try it! I remember only looking at fat and calorie grams too. When my dd was diagnosed with type one diabetes I started looking at the carb and sugar grams – rarely the ingredients. I'm the only one gluten free in my family but I would buy these for my family over FL. I remember when Kellogg's came out with less sugar cereals including FL. I was giddy about that. Totally ridiculous when I think of all the other junk in them besides gobs of sugar that I didn't even bat an eyelash over. These sound sooo good! Hope they come to my area. These sound awesome. Most gf cereal tastes bland by itself. I think I could eat this out of the box like I used to! Heidi I dont know how I can tell you enough that you help me some much with trying to keep my son with Eosinophilic Esophagitis healthy and happy while keeping me so educated. (we are no wheat/gluten, dairy free, soy free, nut free, apple free, egg free soon to be alot of no things as well) Thank you for all your hard work and I will be sharing this on my FB page. I've been on a food documentary kick right now via Netflix. When will America wake up and demand better non GMO, non HFCS foods, etc.?? I literally have been trying to tell anyone and everyone that will listen. Thank you!! What a fun food to be able to share with my son! OMG I have never heard of these!! I am the only gf eater in my house, which makes it almost worse because I almost never buy "extras" like cereal for myself, I spend our grocery budget on my kiddos 😉 Thanks for the awesome website and the giveaway!!! would love to win this for my hubby and little boy! Oh my, oh my! We are eating sooo many unhealthy food it mind boggling! Even worst – our future children may suffer from our diet. New Reader! I followed you on twitter! I liked Adventures of a gluten free mom on FB! I liked Freedom foods on FB! I followed wholesome international on twitter! this would be my regular comment for the regular entry. even if i don't win I will be purchasing for sure. i am trying to steer us to allergen free eating as much as possible and this would be a major boost for my case with a celiac husband who thinks gluten free fruity pebbles are an okay breakfast for him and out daughter. (not!) Thank you and i will be back often! Would love to try these for my kids! They are gluten and dairy free, and we have recently started avoiding dyes. I follow Freedom Foods on facebook. My son is 18 months old and a Celiac. I am ever grateful for your information and help since I am so new to this and my 3 older children are on a normal diet! What a great giveaway! Thanks for the chance to win & try these products. I'm a Freedom Foods friend on facebook. Would love to win….liked them on FB also!!! I would love to win this giveaway! My daughter easily converted to GF, but it's my husband I'm still working on! Thanks for your post. Is it any wonder why the cancer rate is so high these days? We want real food not food chucked full of chemicals.